Content: According to postmodern scholars, subjects are defined only through their relationship to institutions and social norms. But if we are only political people insofar as we are subjects of existing power relations, there is little hope of political transformation. To instigate change, we need to draw on collective power, but appealing to a particular type of subject, whether "working class," "black," or "women," will always be exclusionary. This issue is a particular problem for feminist scholars, who are frequently criticized for assuming that they can make broad claims for all women, while failing to acknowledge their own exclusive and powerful position (mostly white, Western, and bourgeois). 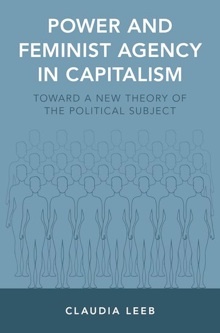 Recent work in political and feminist thought has suggested that we can get around these paradoxes by wishing away the idea of political subjects entirely or else thinking of political identities as constantly shifting. In this book, Claudia Leeb argues that these are both failed ideas. She instead suggests a novel idea of a subject in outline. Over the course of the book Leeb grounds this concept in work by Adorno, Lacan, and Marx - the very theorists who are often seen as denying the agency of the subject. Leeb also proposes that power structures that create political subjects are never all-powerful. While she rejects the idea of political autonomy, she shows that there is always a moment in which subjects can contest the power relations that define them. For reviews of the book on the Oxford University Press website click here. 1. Political Theory (Published online: May 2018), 11-22. 2. Perspectives on Politics (vol. 16, no. 1, February 2018), 168-170. 3. Hypatia (Hypatia reviews online, 2018). 4. Politics and Gender (vol. 14, no. 3, September 2018). 5. Choice (vol. 55, no. 9, May 2018). Furthermore, a podcast interview with New Books in Political Science appeared in 2017.